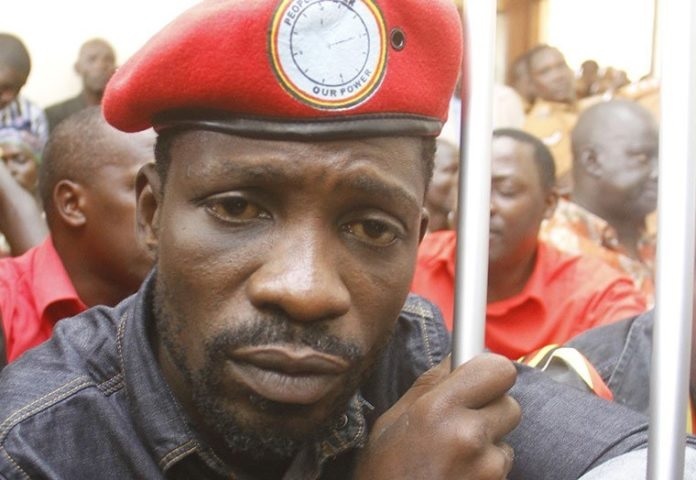 Tuesday, September 04, 2018 - Ugandan musician turned fire brand politician, Robert Kyagulanyi better known as Bobi Wine, has narrated how he was arrested and tortured by security officers last month. The 36-year old, who is currently receiving specialized treatment in the US, wrote a lengthy post on Facebook to set the record straight and it’s just heart-breaking. What these dictators and tyrants can do to fellow citizens is just despicable. Read the post below and try not to cry. We watched the 7:00 pm news from the hotel lobby as we took tea and took stock of the day’s events. It was of course very exciting to watch that day’s news. The anchor said we were clearly ahead of the other candidates and the television relayed images of the massive rally and procession we had had on that day. Shortly after, I decided to move to Pacific hotel where I was staying so as to rest after the very busy day. It was at that point that I sat in my tundra vehicle, in the co-driver’s seat. The gentleman who was driving the tundra that day is one of our drivers (not Yasin). He moved out of the vehicle to call other team members who were supposed to drive with us. He took a bit long and I moved into my other vehicle (a land cruiser) which was right next to the tundra and whose driver was already seated on the driver’s seat. We immediately set off for Pacific hotel. I did not even see what happened after or how late Yasin ended up on my seat in the tundra. For clarity, he had been driving another vehicle that day. I stayed put for some hours, and I could hear the soldiers come every few minutes, bang some doors on my floor or other floors and go away. At different times I would sleep off, but was always rudely awakened by the banging of doors and the impatient boots that paced throughout the hotel for the whole night. In the wee hours of the morning, the soldiers started breaking doors of the different hotel rooms. With rage, they broke doors, and I knew they would soon come to my room. I, therefore, put my wallet and phone into my socks. I also had with me some money which I had earned from a previous music show. I also put it into the socks. “Bobi, I am sorry but not all of us are like that. Some of us actually like you,” he said. He said that doctors were on their way to treat me. I stayed in the same position and after a few hours, about four soldiers came in and lifted me on a piece of cloth. One of them took a picture of me, (I hope to see that picture some day in my life). As we went out, I read “Arua airfield’ somewhere. I was taken into a waiting military helicopter and taken to a place which I later found out was Gulu 4th Division military barracks. It was at that facility that some military doctors came in and started giving me injections.